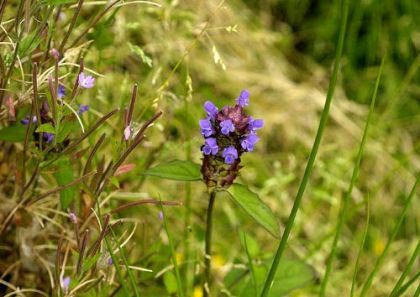 Self-heal is not easily confused with other wild plants on this web site. Also known as 'Heal All' and 'Ceannbhán beag', this low-growing (to 20cm) little perennial of bare and grassy places is widespread throughout Ireland. Generally hairy with creeping stems and paired oval leaves, it bears its blue-violet flowers (10-15mm long) in short, dense, cylindrical whorls which have purplish bracts and calyx teeth. The individual little tubular flowers (12mm) have two-lobes, the upper concave, the lower flat and three-lobed. This is a plant beloved by bees and moths, is native to Ireland and belongs to the family Lamiacae. I first identified this plant in 1973 at Cleggan, Co Galway and photographed it in 2005 in Gibletstown. Later in 2009 I came across the more rarely found white and pink blooms (pictured below) near Tullycanna, Co Wexford. They were growing alongside the violet variety. 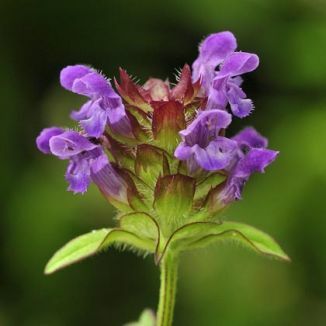 Self-heal has long been regarded to have medicinal virtues as its name would suggest. In the seventeenth century Nicholas Culpeper wrote of it as a wound herb 'whereby when you are hurt you may heal yourself'. It is now know to have anti-allergenic constituents and to act as an anti-inflammatory agent . From the National Folklore Collection, University College Dublin. NFC S.455:234.